Thinking of where to treat your new graduates? Here is a list of restaurant promos and deals you can avail. Click on the next button below each entry to see the next one. 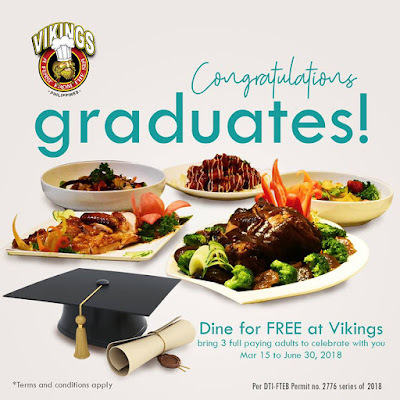 Dine for FREE at Vikings! 1. Members of the Graduating class of 2018 get to eat for FREE as long as accompanied by THREE (3) full paying adults. 2. The graduates (Kindergarten, Elementary, Junior High, Senior High, Undergraduate Course, and Graduate School) should present ANY of the following: Diploma, Graduation Photo, or Graduation Program with the graduate’s name/ceremony invitation (all supported by the school ID). 3. This promo is available on weekends and weekdays including holidays for both lunch and dinner, but CANNOT be used in conjunction with other in-house promotion or discounts. 5. The purchase of goods and services which are on promotion discount, the senior citizen can avail of the promotion discount or the discount provided under the expanded senior citizen act of 2010, whichever is higher. 6. Promo runs from March 15, 2018 to June 30, 2018. Across all Vikings Luxury Buffet Restaurant branches nationwide. Reserve now at VIK-INGS (845-4647). 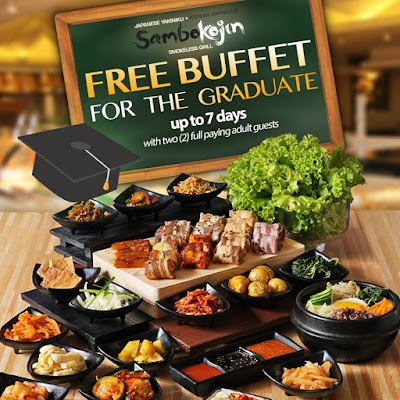 FREE GRADUATION BUFFET at Sambo Kojin! You have 7 days from your graduation ceremony / moving up day to claim it. Just bring two (2) full paying adult guests with you during your visit. 1. 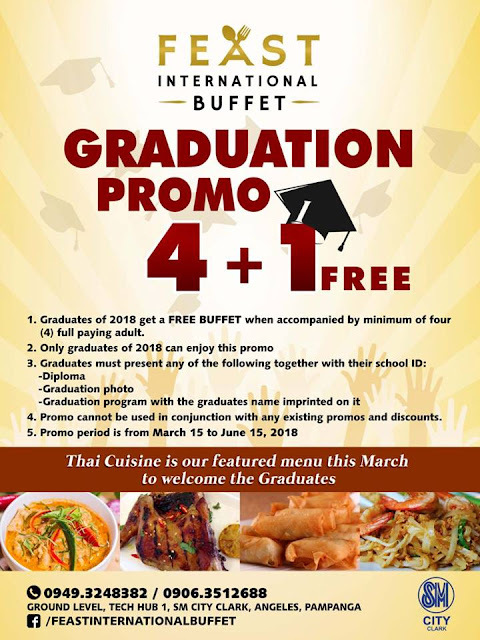 Free buffet for every graduate/moving up student of 2018 who will celebrate and dine in any of the participating restaurants accompanied by two (2) adult guests, on Graduation Day/Moving-up Day and seven (7) days after. For the promo, each full paying adult guest is charged the regular price of P888. FREE Buffet for the Grads at Dads with two (2) full-paying adults! 4. Promo runs from March 1, 2018 to May 31, 2018. Not valid with any other existing promotions. Graduates eat for FREE at the Feast (by Chef Lau) International Buffet at SM Clark. Graduates of 2018 get a FREE BUFFET when accompanied by a minimum of four (4) full paying adults. Only graduates of 2018 can enjoy this promo. Promo cannot be used in conjunction with any other existing promos and discounts. Promo period is from March 15 to June 15, 2018. 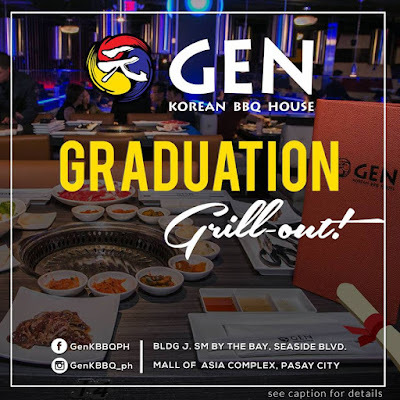 Celebrate your success with family, friends, and unlimited US Premium meats at Gen Korean BBQ House, SM Mall of Asia Complex. Just present your proof of graduation (e.g. 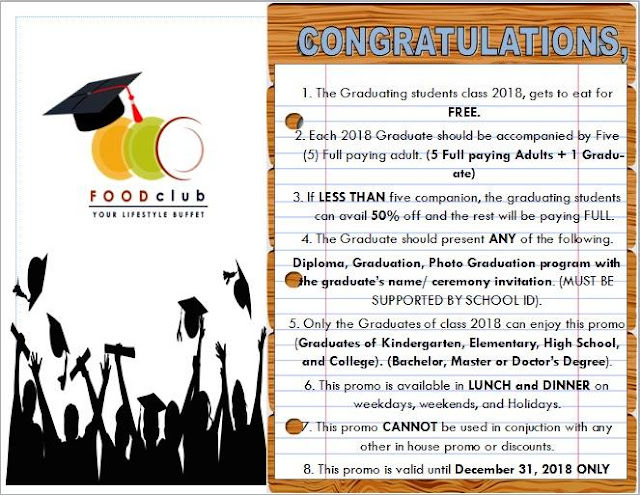 2018 diploma, graduation photo, school Id) and avail of our 5 + 1 promo PLUS a FREE cocktail carafe! Promo is applicable from March 1 to April 30, 2018! 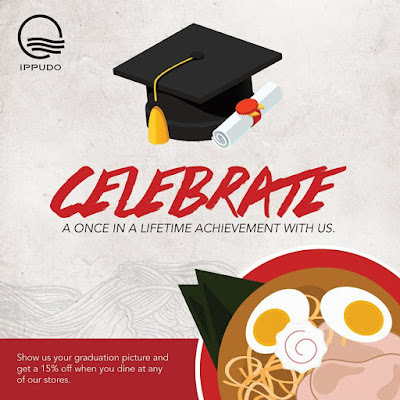 Just present your diploma or a graduation photo and get a 15% off when you dine at any of Ippudo Stores. 3. Valid from Mondays to Thursdays, 10:00 AM to 6:00 PM only. 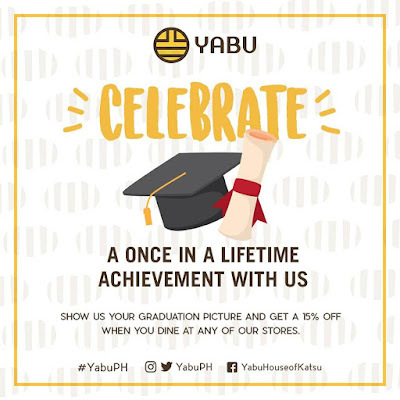 Get 15% off when you dine at any Yabu Stores. 3. Valid Mondays to Thursdays, 10:00 AM to 6:00 PM only. 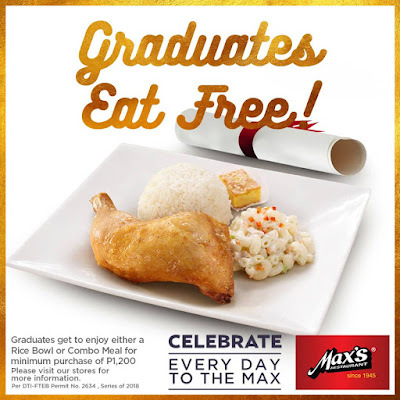 Graduates Eat Free at Max’s Restaurant! 1. 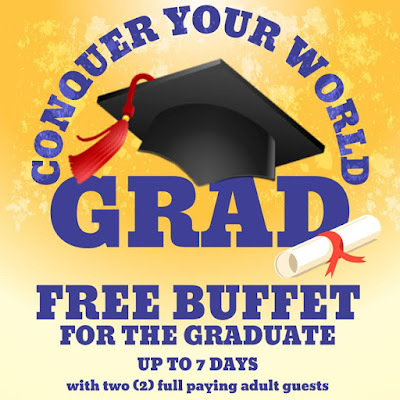 Free buffet for every graduate/moving up student of 2018 who will celebrate and dine in any of the participating restaurants accompanied by two (2) adult guests, on Graduation Day/Moving-up Day and seven (7) days after. For the promo, each full paying adult guest is charged the regular price of P499 (Weekdays) and P599 (Weekends). This promotion is not available for Midnight to Morning Buffet. 2. 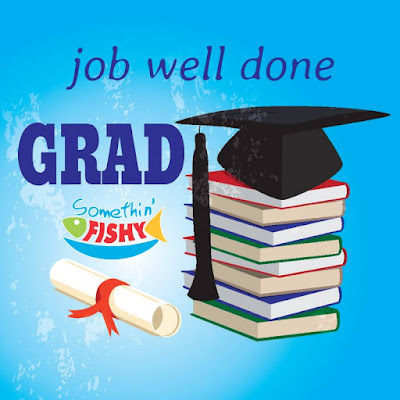 To claim, Graduate/Moving-up students must present to any of Somethin’ Fishy dining personnel any of the following: Diploma, Graduation/Moving-up photo, Graduation/Moving-up Program/Ceremony Invitation with Graduate’s name (all supported by school ID). For as low as P999 per person. 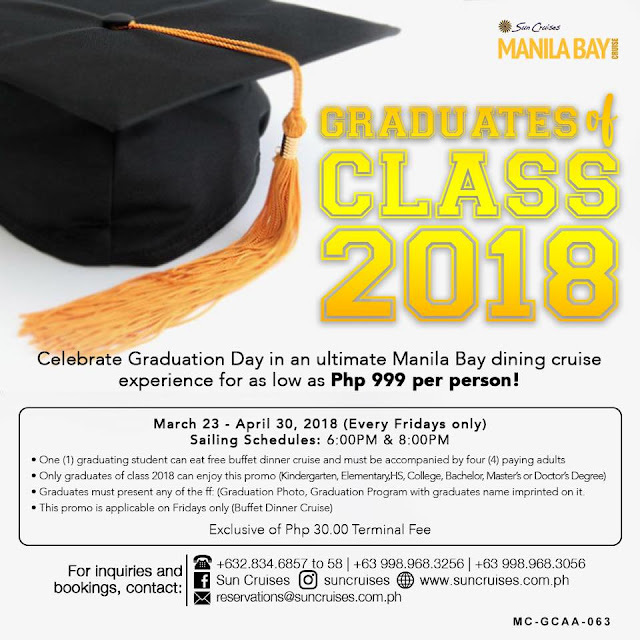 Graduating student gets a FREE buffet dinner cruise if accompanied by four (4) paying adults every Friday from March 23 to April 30, 2018. Treat yourself and your fellow graduates to burgers! For a minimum order of P500, get an Ultimate Burger with bacon, cheese, and a cheese-and-mushroom sauce on the house. Just present an official school ID. This promo is until April 30. Drop by Gen Korean BBQ with five other people, and get to eat for free. Plus, you also get a cocktail carafe on the house. This promo runs until April 30. If you celebrate your graduation here, you can get to eat for free, too, as long as you bring three friends with you! Just be sure to present your official school ID and either your graduation photo, diploma, or a dated invitation to your graduation ceremony. This promo is available until June 30. What Makes Singapore Changi Airport the Best International Airport?